Samba rice, which is the traditional rice in southern India, comes in many varieties. Seeraga muthu and seeraga samba, both of which are aromatic rices, are the most available varieties in the United States. The tiny-grained seeraga samba gets its name from its resemblance to cumin, which is known as seeragam or seera in Tamil Nadu, and is the most expensive rice grown in that southern India state. Seeraga samba is an ingredient in biriyani, a traditional Indian dish. When cooked properly, seerage samba rice grains are fluffy and loose. The important thing to know about cooking rice is the uncooked to cooked yield. The basic cooking instructions vary little. Rinse 1 cup seerage samba rice in a fine strainer and allow the rice to soak in a pot of water for 15 to 20 minutes. 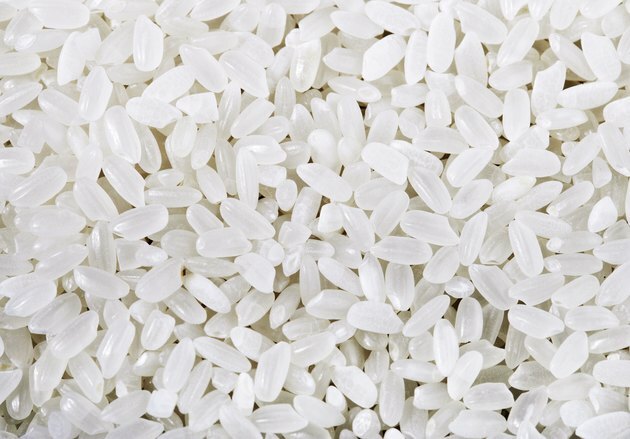 Rinsing and soaking prevents the rice from clumping, but also removes nutrients and some of the taste. Omit this step, if you prefer. Pour 1 ¾ cup of cold water into a 1-qt. sauce pan and add 1 cup of seeraga samba rice. One cup of uncooked rice yields about 3 cups of cooked rice. Place a tight-fitting lid on the sauce pan and set the heat to high. Bring the water to a boil, reduce the heat to a low setting and allow the rice to simmer for about 15 to 20 minutes until the rice absorbs all of the liquid. Do not remove the lid while the rice is cooking. Avoid stirring the rice since the rice breaks easily when it is hot. Remove the pot from the heat when the rice is done and allow the rice to sit undisturbed for five minutes. Avoid removing the lid during this time. You may also cook seeraga samba rice in a rice cooker. Many recipes that use seerage samba rice instuct cooks to add the unrinsed, uncooked rice to other ingredients in hot or boiling water.